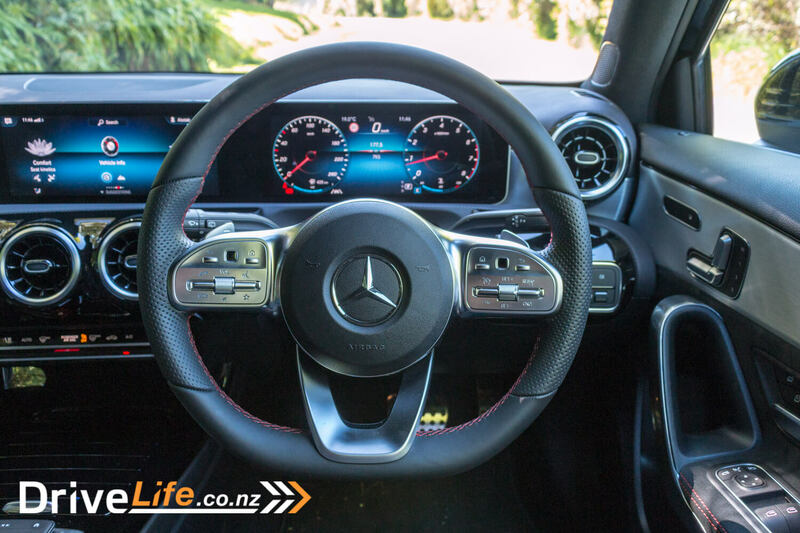 2018 Mercedes Benz A200 – Car Review – A better class of hatchback? The original A Class Mercedes was a bit of an ugly duckling, and the second gen wasn’t much better. Then for the third generation, Mercedes re-invented the car, and suddenly it was a much more desirable proposition. 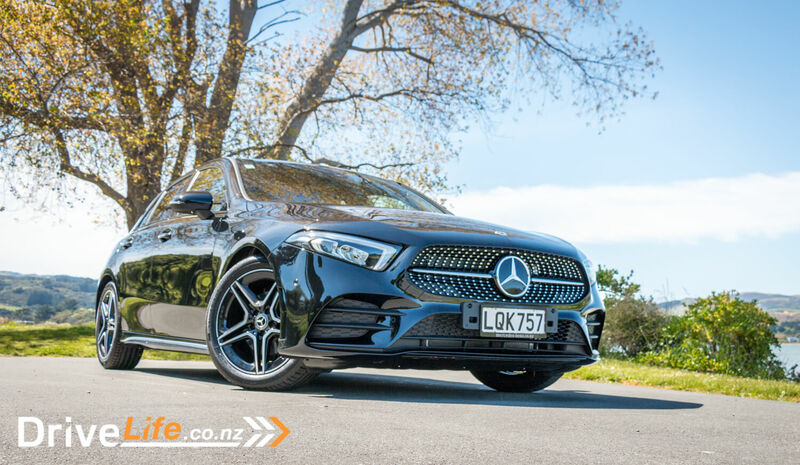 Now there’s an all-new fourth generation car, designated W177, which has already made the shortlist for New Zealand car of the year. We drove one for a week to see if it was really worthy. 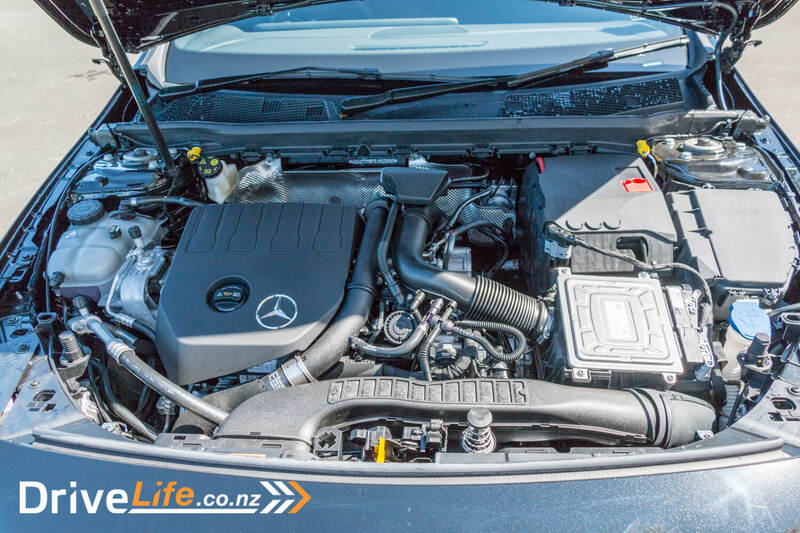 This should be pretty straightforward, as so far there’s only one model available in New Zealand – the A200, featuring a 1.3-litre 4-cylinder turbo engine driving the front wheels via a 7-speed dual-clutch transmission. 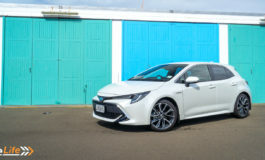 Standard features include 225W sound system with 9 speakers and a sub, ambient lighting, auto-dimming rear-view mirror, climate control, satnav, wireless phone charging, directional indicators, keyless start, reversing camera with dynamic guidelines, auto wipers, 18-inch alloys, Active Parking Assist, cruise control, heated electric mirrors, LED headlamps auto lights, parking sensors (front and rear), Active Brake Assist with semi-autonomous braking function, adaptive highbeam assist, brake drying function and Hill Start Assist, 9 airbags, ABS, Blind Spot Assist, Brake Assist System, Cross wind Assist, ESP with ASR, Lane Keep Assist (active), and Traffic Sign Assist. 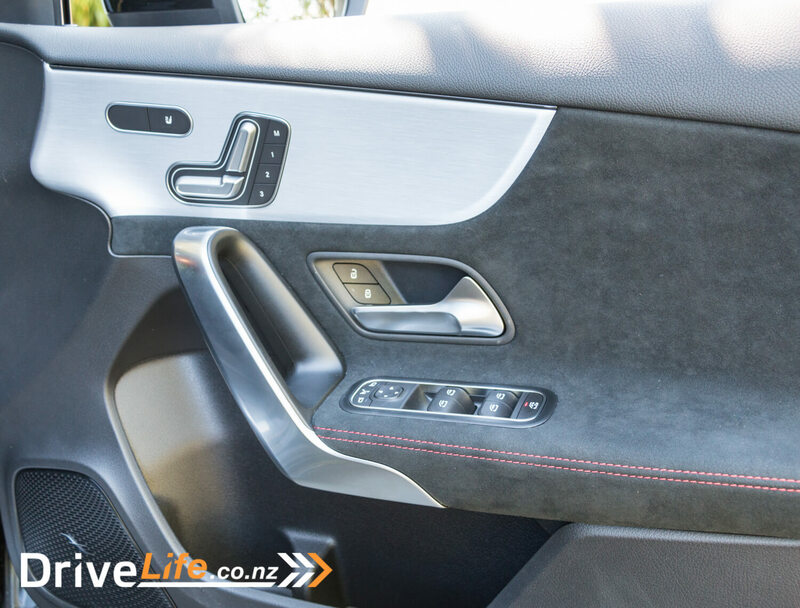 Our review car had the $1290 Seat Comfort Package which adds heated, electric, memory front seats and passenger mirror with reverse parking position. 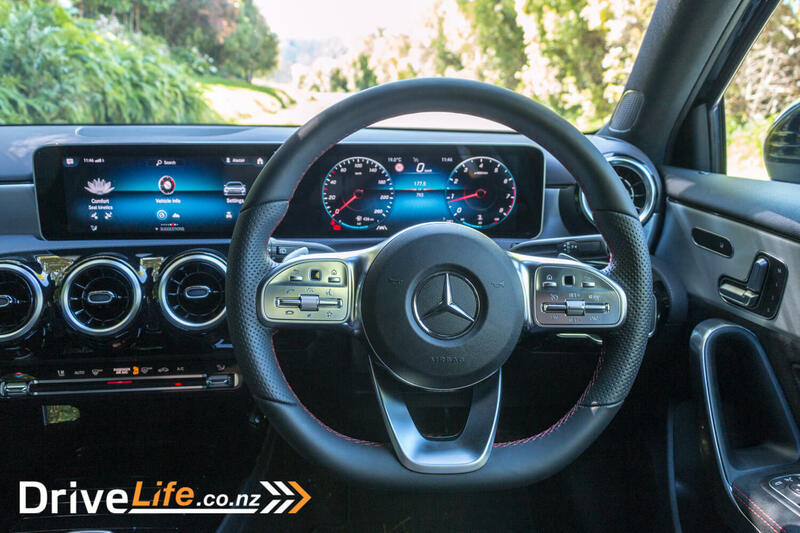 Also fitted was the $1990 AMG Line package, which adds 18” AMG wheels, AMG mats and body trims, various external AMG trims and badges, lowered comfort suspension, Sports Direct Steer system, with AMG steering wheel, sports seats, and sports pedals. There are seven colours available; one red, two blacks, two whites and two silvers. Very sensible, and a missed opportunity in my opinion as this car would look great in some brighter shades. I think the A200 is a great looking car. 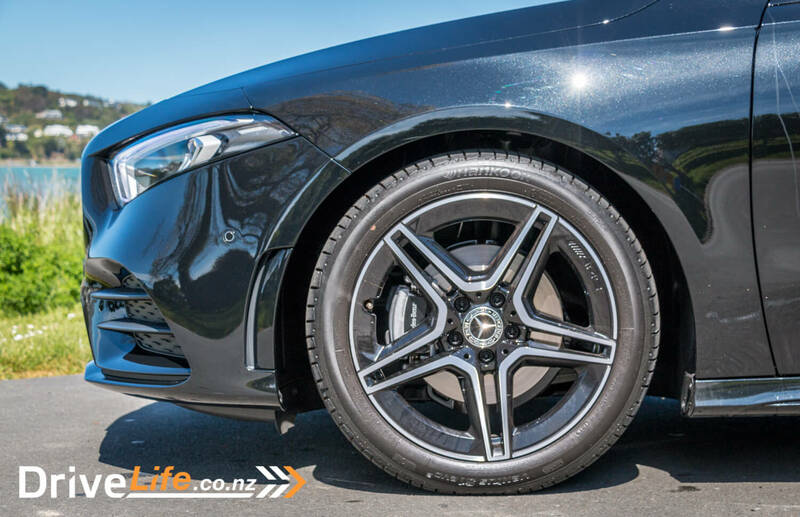 The AMG Line kit definitely helps, with those two-tone 5-spoke wheels, and lowered suspension. The overall look is smart, but classy. Again I think the AMG kit helps here as it adds some extra trims, and deletes some of the chrome, which can look a bit too fussy. The angled lights look just aggressive enough, and fat twin exhausts complete the look at the back. The outside looks good, but inside is where the A200 really wows you. 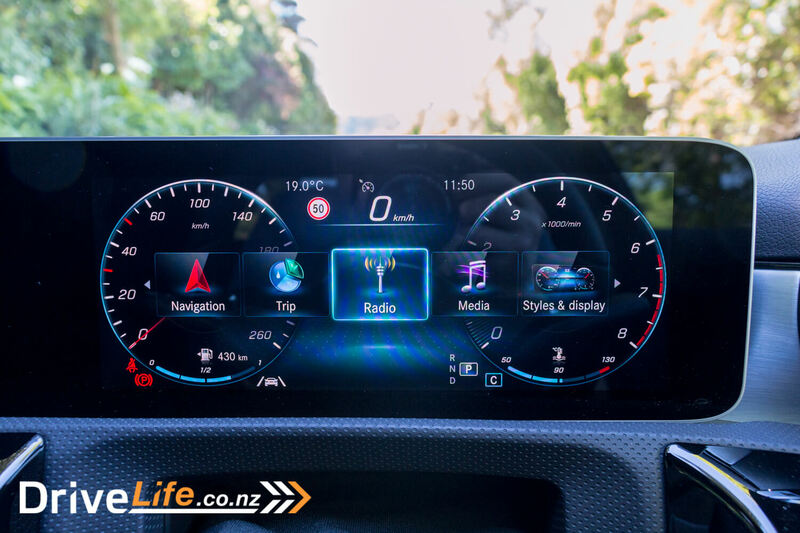 And it’s those twin 10.25” screens that are the dominating feature of the dash. They look fantastic, merged together into one super-wide gloss-black strip. They’re clear, hi-res, with great contrast, and update smoothly enough that they’re as easy to use as traditional analogue instruments. 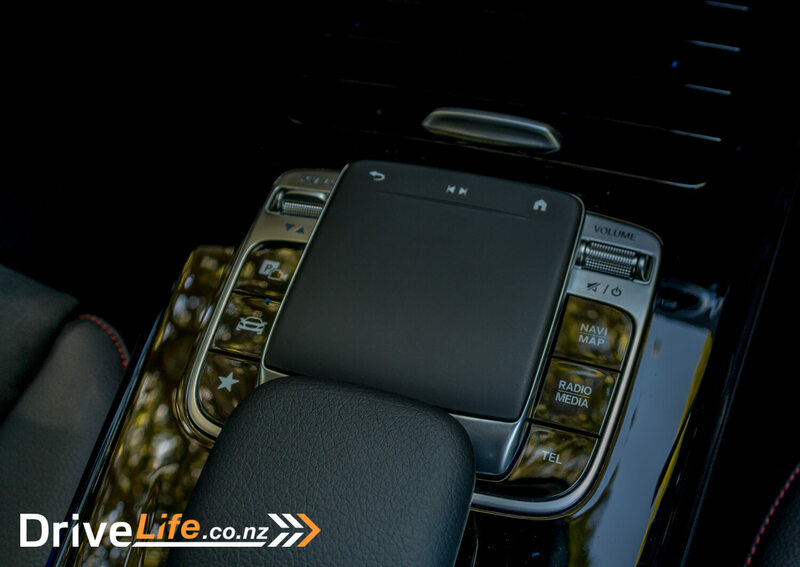 Multiple displays and configurations are available, all configured using either the trackpad in the centre console or two mini thumb trackpads on the steering wheel. It’s intuitive to use, and easy to find what you want. 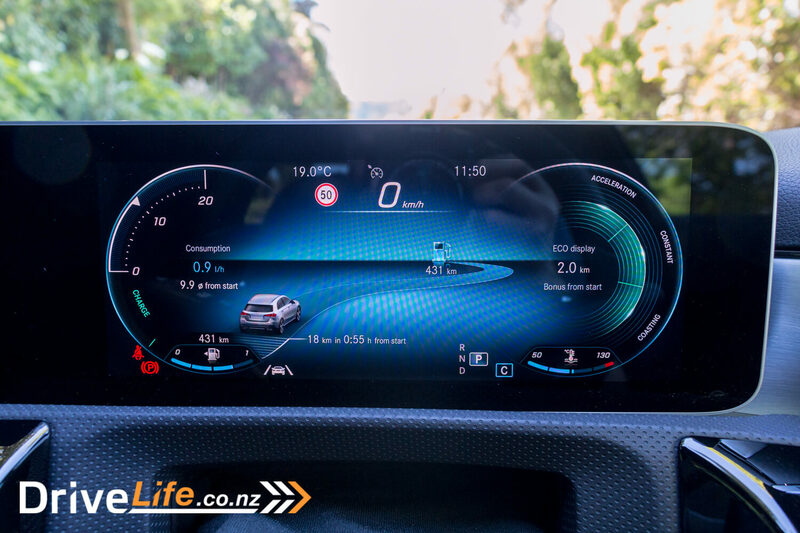 Because so much is done via the screens, the dash has a simple and clean layout, with three large circular vents dominating the centre section. 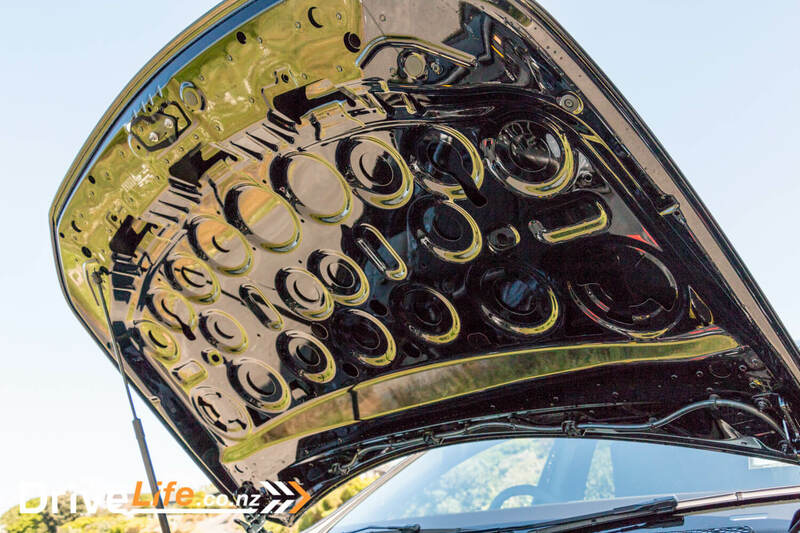 These vents are particularly solid-feeling and give a real impression of quality when you adjust them. 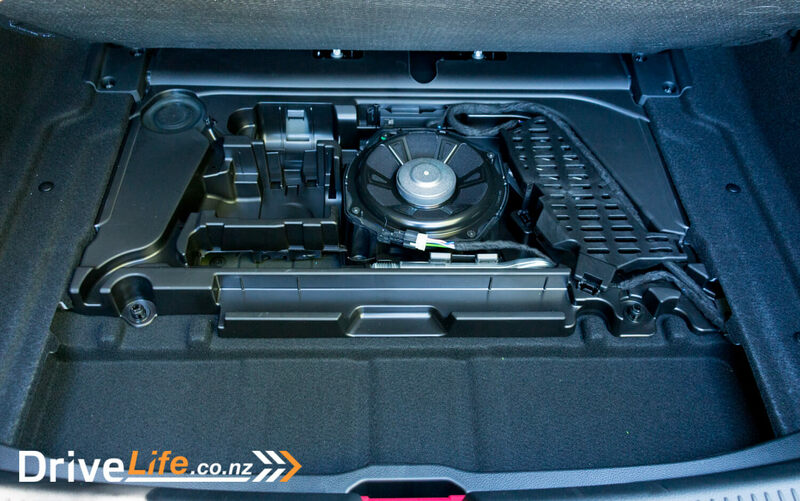 Under the vents are the aircon controls – single-zone in the A200, with dual-zone being an option as part of add-on packs. Our review car came with piano black trims on the dash and centre console, which look great but are susceptible to dust. The doors had more practical brushed aluminium trims, with the main part of the door trimmed in suede. They’re actual pieces of metal too, not aluminium-look plastic like most cars. I also liked the contrasting red stitching on the doors, seats and other trims. The flat-bottomed steering wheel is clad in leather and has a nice thick, chunky feel to it. There are quite a few thumb controls on the wheel – all made of metal, with a nice solid feel. They quickly become easy to use without needing to glance down, and both screens and their functions are easily controlled using the little trackpads. 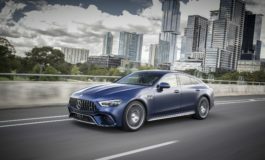 The AMG-Line sports seats are leather-trimmed with suede centres, and have good side bolsters to hold you in place when cornering. The suede is also pretty grippy and adds to the feeling of stability when cornering. 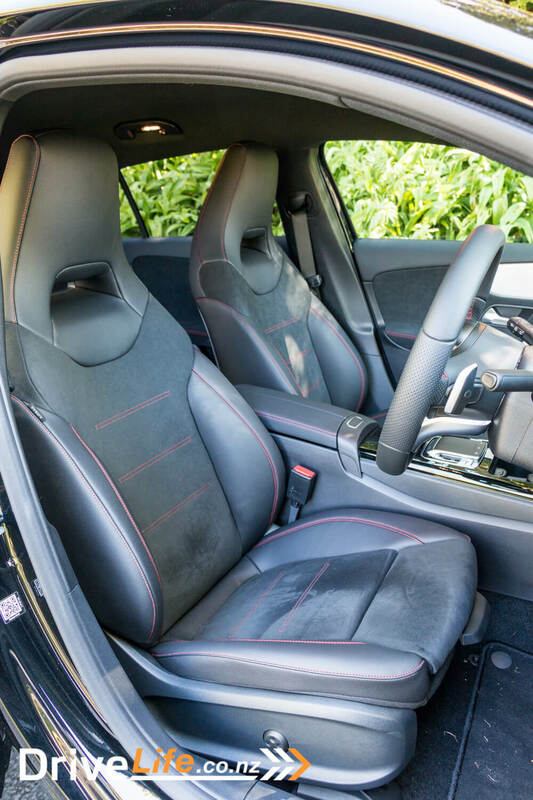 The seats look excellent, with integrated headrests and red stitching picking out details. 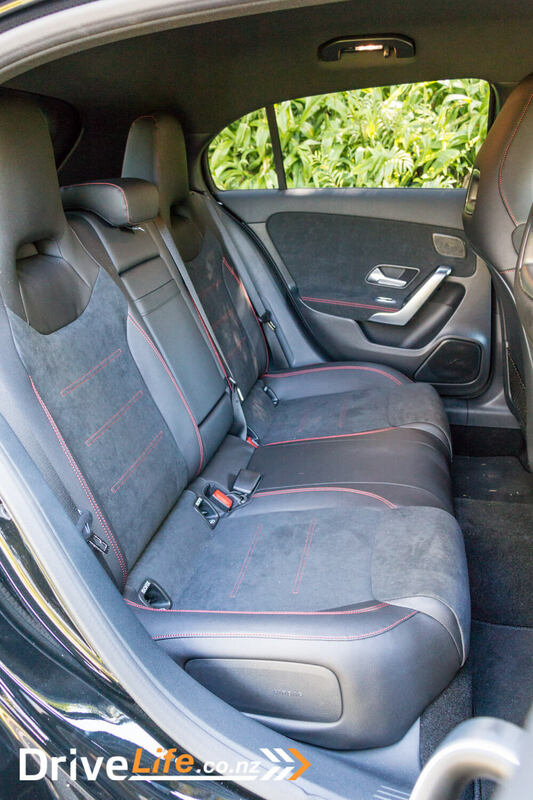 The rear seats match well, with a similar look, and matching integrated headrests. This is a bit unusual and makes them a bit harder to fold flat, as that headrest can hit the front seat. 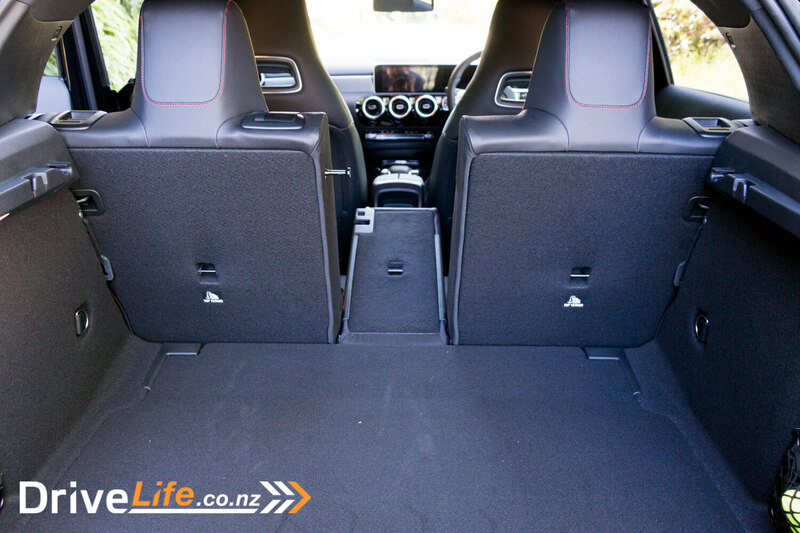 The rear seats are split 40/20/40, enabling you to fold just the centre section to get your long items in the car without having to leave one of the kids behind. 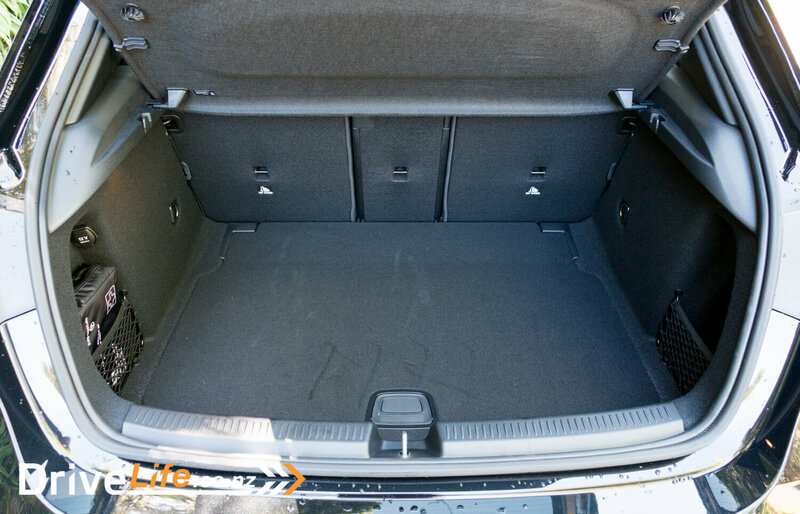 There’s a good-sized 370 litre boot, with some hooks at the side and a power socket for your accessories. 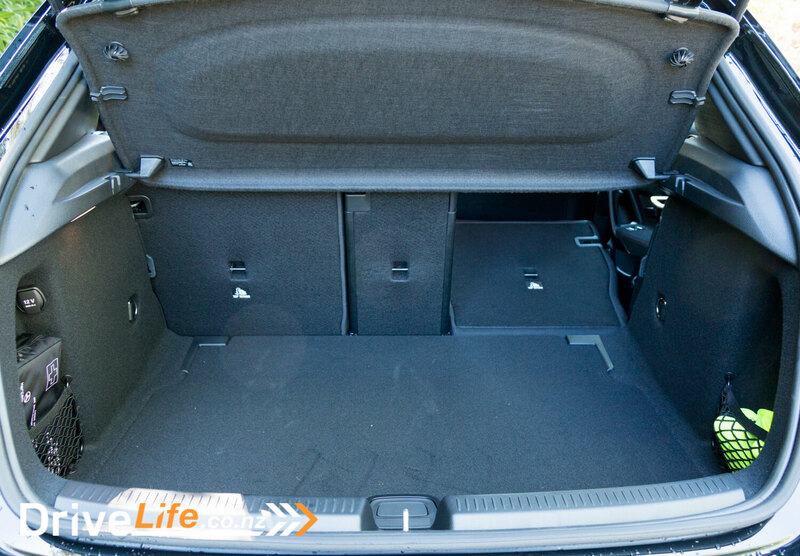 Lift up the boot floor and there’s a slim storage area and a subwoofer integrated into the floor. The boot lid has reassuringly chunky handles, at both sides, with little hooks on them to hang, er, things from. I walked up to the A200 and pulled the handle. Nothing happened. Surely I didn’t have to use the remote to unlock the car? Yep, I did. This should be a standard convenience feature on a car like this, not a $990 option. A little bit of a disappointing first impression. But that was forgotten as soon as I sat inside and those beautiful screens animated into life. The next few minutes were spent playing with the settings, paging through all of the dash themes, gauges, map screens etc. There are a lot of options here and you can see what a few of them look like in the photos. Pairing my phone was painless, with an option to play music via Bluetooth or WiFi. It also re-connected to my phone quickly and returned to my music every time the car was re-started. The stereo is excellent, with very good clarity and plenty of bass from that boot-mounted sub. The standard system is 225W with 9 speakers. Splash out for the $2490 Communications Pack and you can get a 12-speaker surround sound system with a total output of 590W, which must sound amazing. This pack also includes a heads-up display. 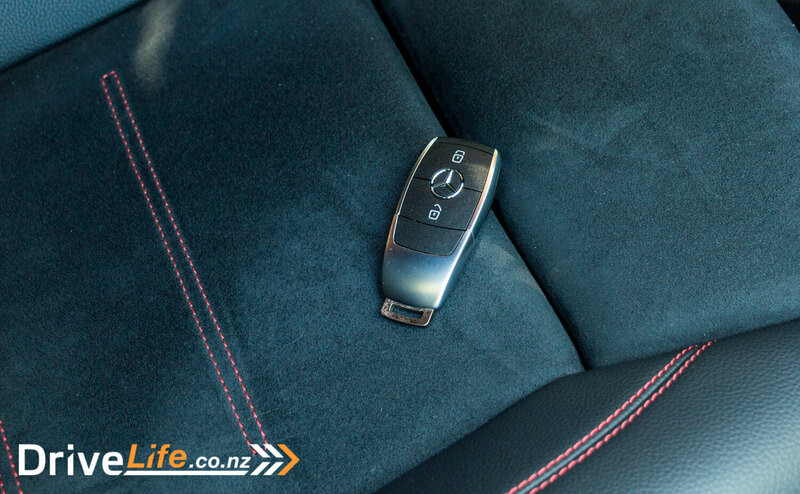 It has been a while since I’ve driven a Mercedes, so I pushed the start button, reached down to find the gear shifter, then got slightly confused until I remembered that in Mercs the right-hand stalk is the gear shifter. The left-hand stalk is a clever combination of indicators, lights and wiper controls. I only put the car in neutral once when I actually meant to indicate! First driving impressions? 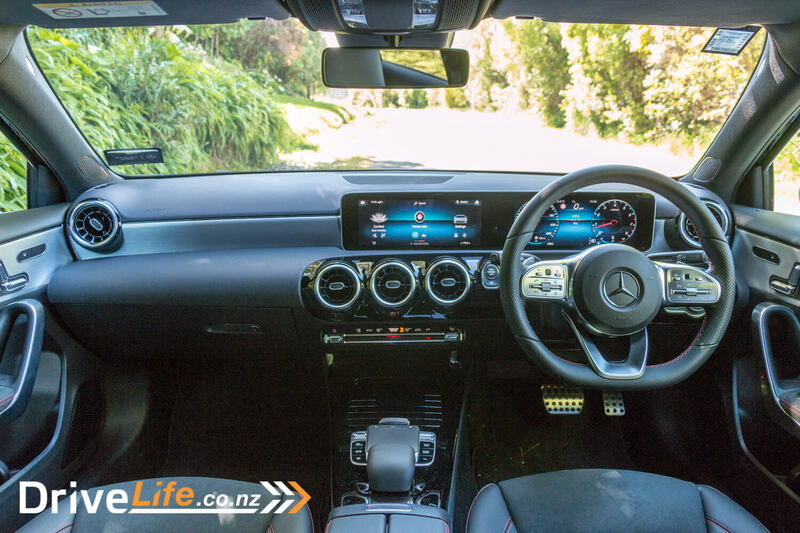 The A200 feels really tight, the steering is quick and accurate, and the AMG-Line suspension is firm but not uncomfortable at all. The performance is really impressive for such a small engine. The 1.3-litre turbocharged 4-cylinder produces 120kW of power and 250Nm of torque, with a quoted 0-100 time of 8 seconds. It feels quicker than that, especially in that 0-50 range that you use around town. I was surprised when I looked at the specs as I thought it was a bigger capacity. It has the sort of satisfying performance that you want in a small city car, that so many don’t seem to have. Out of town on faster roads, the main thing I kept thinking was “It’s so smooth”. Sound and vibrations are beautifully damped, and there’s barely a sound from the engine at 100kph. Shifts from the 7-speed dual-clutch transmission are so smooth that you hardly notice them in normal driving. Take the A200 onto twisty back roads and it won’t disappoint. There’s enough power to enjoy the car, with that little four-cylinder growling away as you accelerate, with a slight hint of turbo whistle. The excellent steering, suspension and brakes give you the confidence to take corners with some enthusiasm. It’s all very well tuned and balanced. 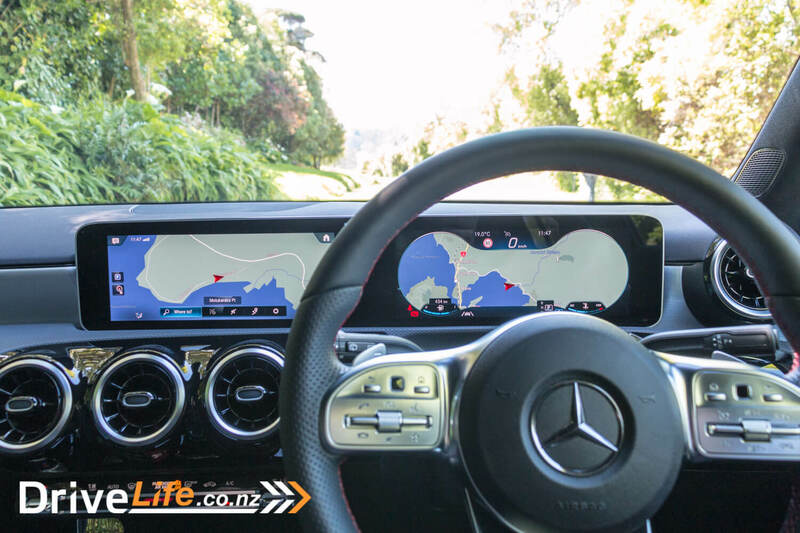 One thing that surprised me is that Mercedes haven’t included radar cruise control. It doesn’t appear to be on the options list either. 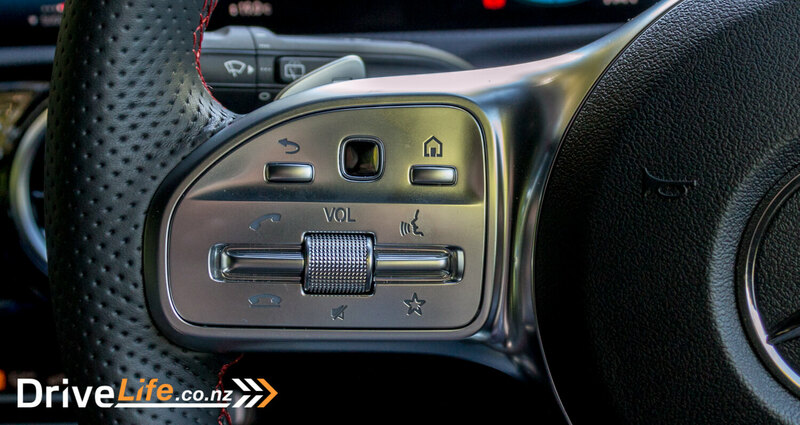 There is cruise control included, and it’s easy to set and adjust using the buttons on the steering wheel. It shows the set speed on the main display, and is better than most others I’ve tested, as it maintains the set speed down steep hills. 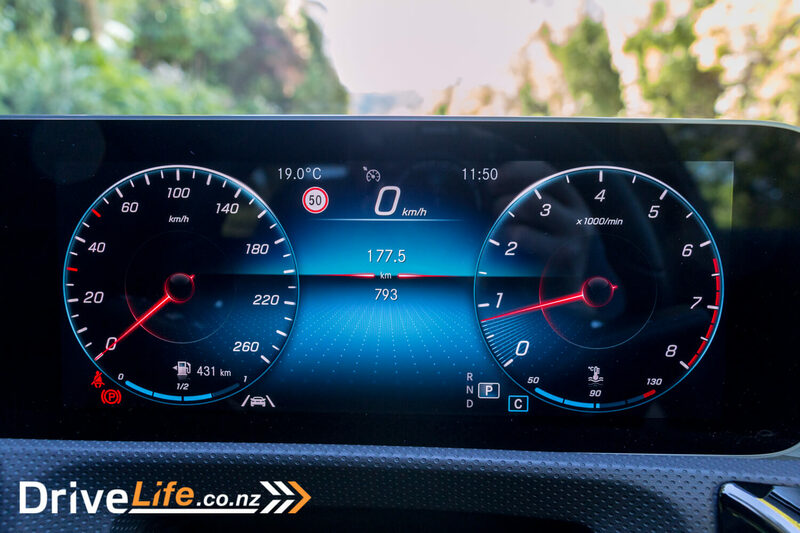 There’s a lot of clever technology in this car – it reads speed signs more accurately than any other car I’ve tested, displaying the current limit at all times, and flashing the number if you exceed the limit. 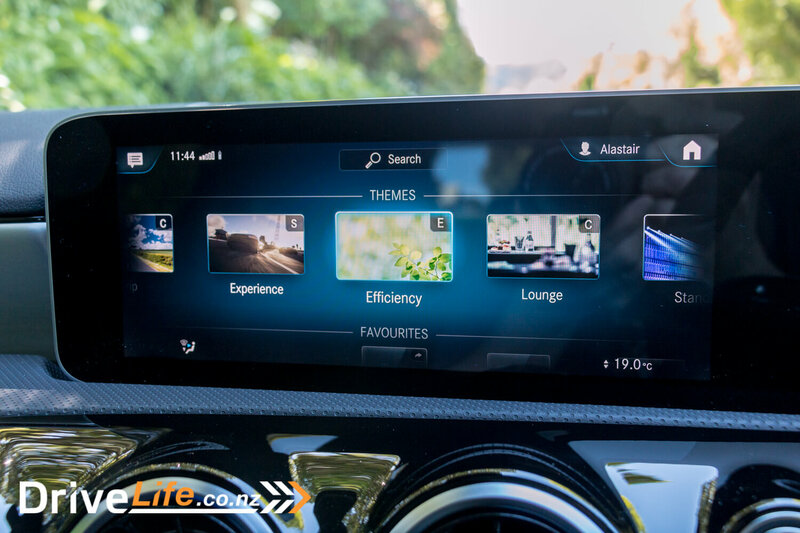 There’s voice recognition – just say “Hey Mercedes” and it will turn the music down and say “How can I help?”. 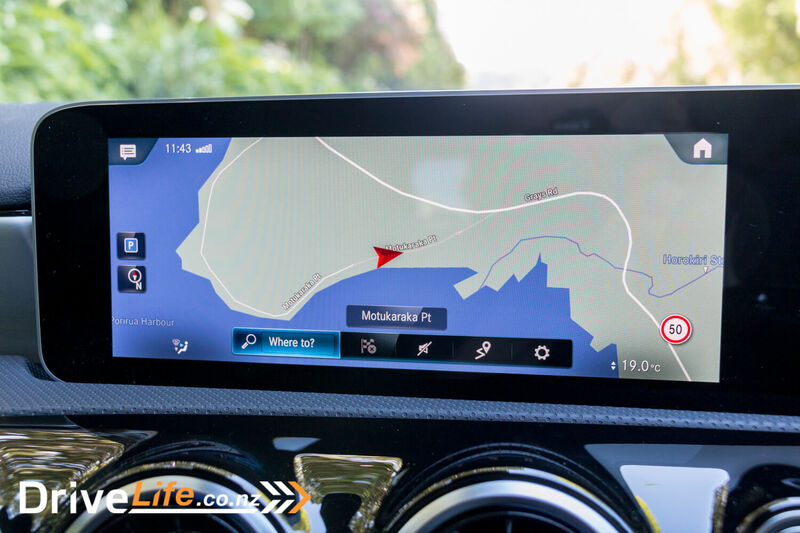 This worked very well, although there were a couple of issues – getting the satnav to recognise spoken street names proved a challenge, and it turns out that as a car reviewer, you tend to say the name of the car a lot when talking about it to passengers. And every single time I said the word “Mercedes” it piped up and tried to help. The A200 has engine stop/start, which works smoothly and is hardly noticeable in action. 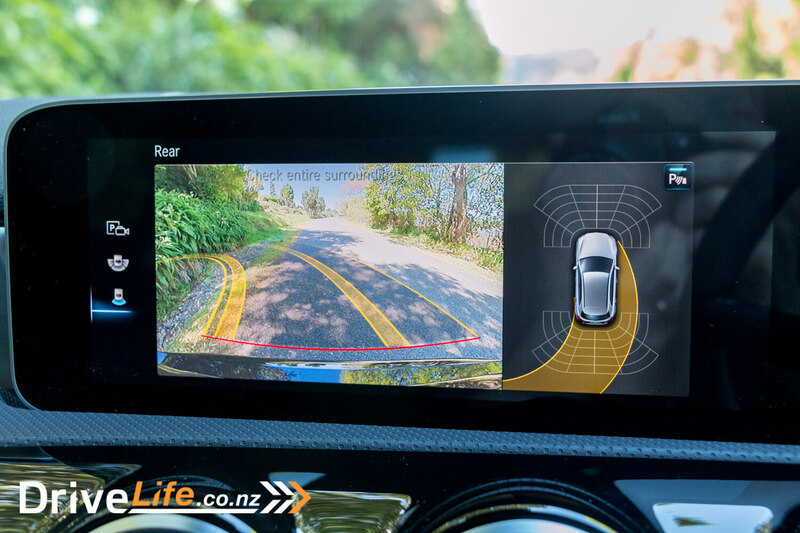 There’s blind spot warning and rear cross traffic alert which are two of my favourite safety features. 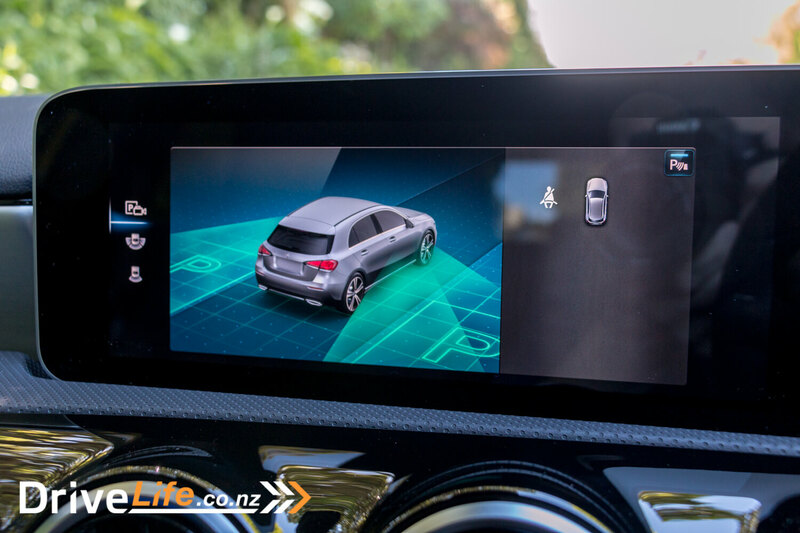 The active lane keep assist isn’t intrusive, and I didn’t think about turning it off like I do in most cars. The auto parking function works well and is quick and easy to use. Generally everything is very well implemented. This is where some of your extra money goes when you buy a Mercedes. 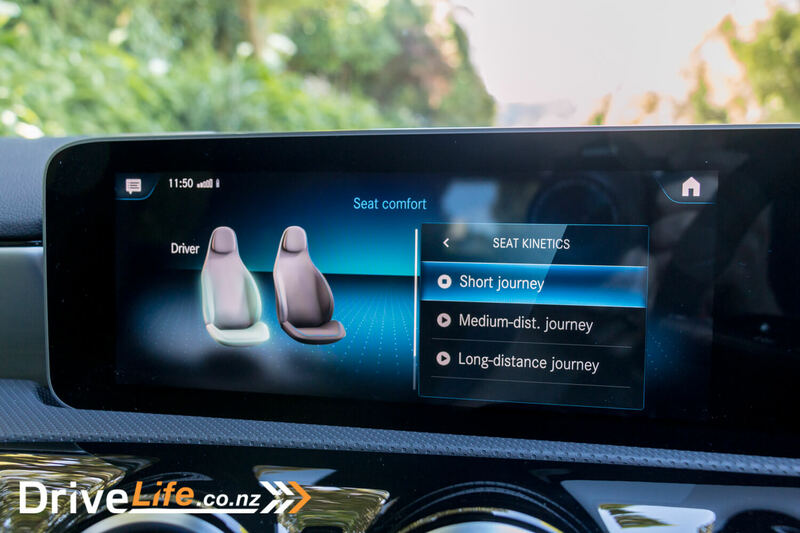 There is one feature that I found rather unusual – Seat Kinetics – set the journey length (short, medium, long), choose a front seat, and the car will periodically adjust the seat position as you drive, moving the seat back, height and angle seemingly at random. It’s really strange, but I’m sure would help stop you getting a numb bum if you’re on a long journey. The A200 is a really good warm hatchback. Its engine has enough go to be fun, but is small enough to be efficient. Handling and ride are excellent, there’s loads of safety technology. 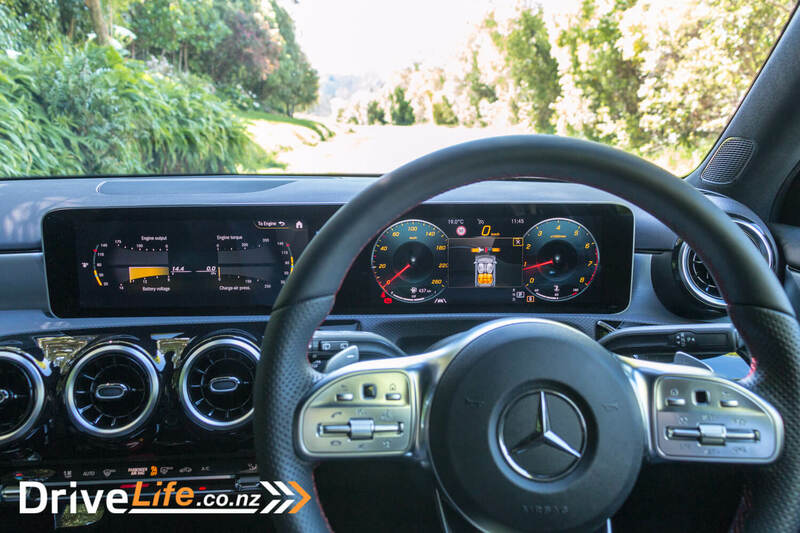 In fact ANCAP have commended Mercedes for an exceptionally high safety score. It is pricey compared to some of its competition, but you get that back in refinement and quality. 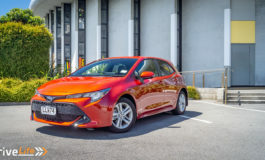 It is a shame there are a couple of features that aren’t included as standard, but it’s definitely a car of the year contender and deserves that nomination. Warranty Three-year unlimited kilometres warranty. 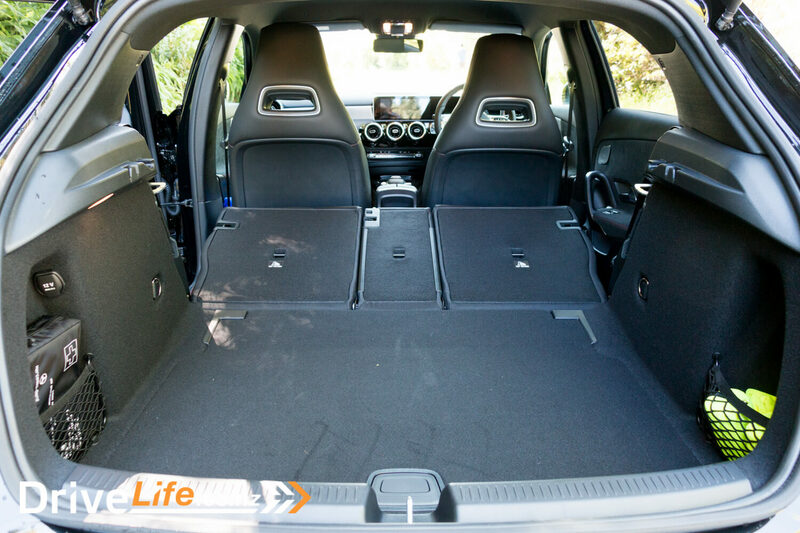 The new A-Class received a particularly high 96% score for adult occupant protection, as well as the equal highest scores to date for pedestrian/cyclist protection (92%) and child occupant protection (91%).